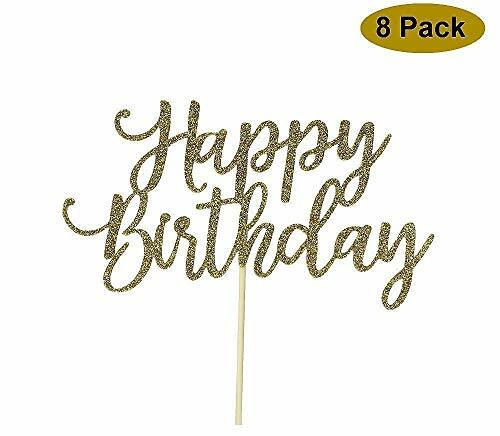 These glitter gold "Happy Birthday" cake toppers will beautify and enhance any birthday party celebration immensely. Just stick them onto any cake and you will have a work of art to present. They are made with sparkling glitter oak tag paper of excellent quality. MADE WITH THE BEST QUALITY-Topper Material: Thick glittery card stock for durable, long lasting decor. Sturdy and will not sprinkle on the food. BEAUTIFUL DECOR PIECE-Will add great flavor and festivity to any birthday party decoration for young and old. PERFECT FOR PICTURES-Use as elegant prop or decor for birthday celebration picture taking. SIMPLE ASSEMBLY-Easily attach stick to "Happy Birthday" design and stick into any cake or pastry. If you have any questions about this product by YOFEY, contact us by completing and submitting the form below. If you are looking for a specif part number, please include it with your message. Nickelodeon Blaze and the Monster Machines Deluxe Mini Cake Toppers Cupcake Decorations Set of 13 Figures with Blaze, JR, Gabby, 9 other Monster Machines and More!